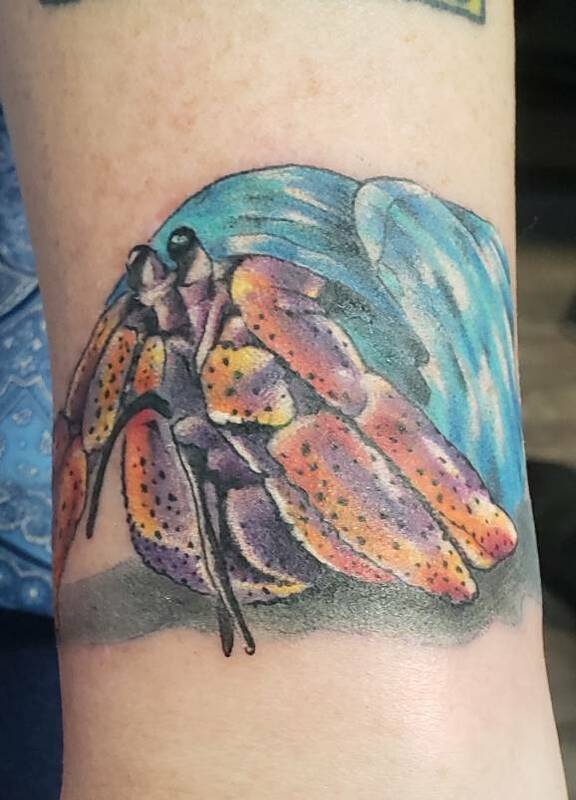 I'm going to be getting a hermit crab tattoo. I'm so excited. That is AWESOME!! You must post a photo when it's done! curlysister wrote: That is AWESOME!! You must post a photo when it's done! Oh, definately!! I wanted to do one from a picture of one of mine but it's hard to get a really clear pic. Ok, at least I'm not the only one thinking about one. I have been debating what approach to take with it. Cartoonish, biomechanical, macabre and so forth. Then location there's location. I think one would look awesome would be on the hand! Fingers would be legs! Hands don't take the pigment very well and tend to get ugly due to all the movement. Not to mention they really swell up and hurt. I'm looking forward to see what you come up with. I'll usually let my artists know what style, location, and maybe a few reference drawings then have them come up with an initial outline. So far they have come up with crazy stuff I never would have thought of. Even if you have several pictures of a particular crab you want and a picture of the right position of another crab your artist should be able to "tweak" it. I agree with Motorcrab - an artist should be able to do what you want. Find an artist who has done tattoo's of similar things, like maybe reptiles or lobsters etc, and ask them for a consult. I have a large snowy owl on my back. I chose the artist based on a number of birds he had in his portfolio, even though he had never done a snowy owl before. I gave him some reference photos of what I was interested in, and he drew up his interpretation of it. Honestly, the final artwork wasn't exactly what I had in mind originally, but I loved it as soon as I saw it, and love it on my back! I have 17 tattoos. (I think). Been there done that. I wanted photo realism but it's more expensive so I'm going with a litlle less real. But not cartoonish. And it's a coverup. I may have to postpone cause I have to help my son with rent. Ooooohhhh, sorry if I assumed you were a newbie to tattoos! curlysister wrote: Ooooohhhh, sorry if I assumed you were a newbie to tattoos! I'm so excited! I'm getting the tattoo tomorrow! I was hoping to use a pic of one of mine but it has to be a really clear picture. So I scoured the internet looking for the right pose, the right coloring. Good luck! Any idea how long your session will be, or how big you are going with it? Can't wait to see the finished product. Motörcrab wrote: Good luck! Any idea how long your session will be, or how big you are going with it? Can't wait to see the finished product. It might be about 3hrs. Ugh! The realler it looks the longer it will take. WOW!! That's awesome!! I can't tell from the photo where it is/ how big it is. But it is fabulous! curlysister wrote: WOW!! That's awesome!! I can't tell from the photo where it is/ how big it is. But it is fabulous! Thank you! It's on the top of my left wrist. Sweet! You can definitely tell it's a PP! Very colorful! Now I want to get another. Isnt is odd how they can be tattooing one area but you feel it on your side or someplace else. Also how one area you may not feel a thing. Then they move 1/8" and it's like slicing razors. Just be sure you follow up with the proper care your artists instructed for the next two weeks or so. My shop started using Tagaderm a few years back. I was actually their fist client to try it on my side piece. Hospital use it for burn victims and other skin trauma injuries. It takes a lot of the lotion, and cleaning out of the picture. It is similar to plastic wrap but sticky on one side. It basically makes a faux outer skin. It doesn't scab or anything. My side came out flawless with every session. How long did you end up sitting?